Our base office is in North Haledon, NJ, with a storage & Fabrication warehouse & additional office space in Paterson NJ. We also have a sister office in Manhattan for our NYC clientele. Phoenix System has been recognized as an established leader in the custom audio and video industry. With more than 26 years in business, staying on the cutting edge of technology has always been a top priority within our company. We work closely with top quality builders, architects and interior designers to ensure our clients’ satisfaction & go beyond the usual concept and designs with our innovative, out-of-the box thinking to create an outstanding audio video experience. Combining our audio video expertise with home automation and computer networking, Phoenix Systems has created a unique combination of talent within our company. The technology of audio/video and computers hav become united over the few past years and we ensure home networks and media servers can handle both your entertainment and computer needs. Phoenix Systems is optimally positioned to provide the highest level of expertise across the broad spectrum of possibilities. Phoenix System receives numerous requests by other A/V companies to design, install and program systems for their clients, as well as provide technical support for their team because of our extensive knowledge, creative designs, and superior skill. Our extensive portfolio includes custom work done not only in the NY / NJ metropolitan area, but extends across the country as well as to Europe and the Military. Andrew Vaccaro, the owner of Phoenix Systems, as well as our resident designer and programmer, has been in the industry since 1980 and founded Phoenix Systems LLC in 1987. He has made his mark on the industry with a multitude or superior designs and an array of ground breaking new products. His many outstanding accomplishments have been recognized in CE Pro, USA Today, and Kitchens & Baths magazines. We have also been featured on the TV shows ‘Indoors Out’ and ‘I Want That’. Phoenix Systems Services is a total solution provider in the digital A/V industry. The basis for communication is to deliver the right message to a target audience. Phoenix SG offers complete turnkey solutions to audio, video, controls and multimedia needs including, but not limited to consultation, cutting edge research and development, proprietary hardware, installation, individual content design and management, and 24/7 network monitoring and technical support. As the client, you make the decision as to whether you want our team to design and complete your project from start of finish or whether you want a more hands on approach. Our expert consultants have a resolution for every budget, involvement level, and market need. As a client of Phoenix Systems, you are putting your AV, Automation, Home Theater & communication needs to work in the most current medium available. We are dedicated to providing a solution tailored specifically for you, the client. We will translate your needs into reality in the most dynamic, revolutionary form available in today's world; a form that projects your ideas into reality. This allows for your desired result to come to fruition in a matter of moments. Phoenix SG is your complete solution for total A/V integration. Ffor over 25 years Phoenix SG has delivered unmatched solutions where they’re needed most; in the hands of the customer. 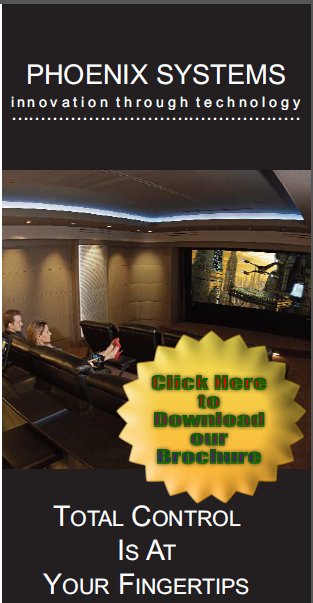 Experience untimate control in a new home theater from Phoenix Systems. Now your family can play movies, watch TV, access a media server and even check in on what the kids are doing all from a handheld touchpanel. Intregrate lighting, music, wall shades, and heating & cooling for total comfort at your fingertips.